Give your fabric the protection it needs! 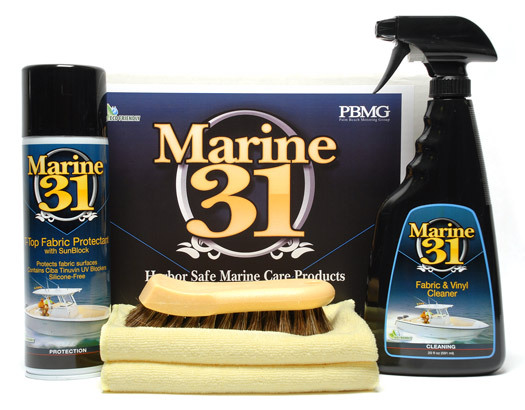 The Marine 31 Canvas & Fabric Care Kit gives your boat a fighting chance against the tough marine environment. Sea air and sunlight lay siege to your boat's canvas and fabric surfaces. If left unprotected bimini tops, sail covers, and boat covers will quickly age and degrade. In order to maximize protection you must have a clean surface. That is why the Marine 31 Canvas & Fabric Care Kit includes the excellent Marine 31 Fabric & Vinyl to cleanse and prepare the surface. In order to increase the cleaning power in a gentle manner, a Natural Horse Hair Brush is included. Once cleaned, coat fabric and canvas with several coats of Marine 31 T-Top Fabric Protectant with SunBlock for the ultimate in protection. A Word from the Captain's Chair: In order to get the best protection possible it is important to clean your fabric or canvas first. Clean the surfaces with Marine 31 Fabric & Vinyl Cleaner first, then apply Marine 31 T-Top Fabric Protectant to lock out the sun and sea's damaging effects. Look great while you sail the seas! Anchors up!